Should I Stand or Should I Kneel? September 30, 2017 5:02 pm / 2 Comments on Should I Stand or Should I Kneel? Are the NFL players who kneeled in protest at the National Anthem to be reviled, or were they being courageous? Did they insult our nation, or is their freedom to action what our flag stands for? 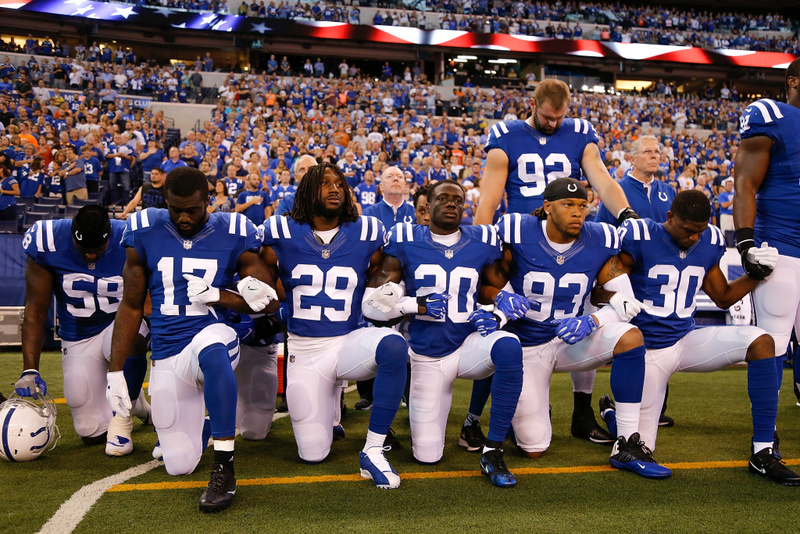 Were the protesting players disrespectful or patriotic? These questions vexed the nation in recent days. People argued and took sides. Tempers sometimes flared. Angry posts or tweets were exchanged. And somewhere in a Russian troll farm cyber warriors were smiling. This National Anthem flap is a perfect example of how we are being manipulated by higher powers in the media sphere every day. Some of the bad actors are foreign, such as the Russia operatives at the Internet Research Agency in St. Petersburg, with its army of automated bots, who took to Twitter once again to polarize our public discourse over the NFL protest flap. The truth is that Russia has been doing this type of thing for years; Using social media platforms on the internet to post extreme and inflammatory messages on opposite sides of every issue. This is just one of Russia’s many methods to sow discord and to splinter our national unity. Their goal: Polarize our politics, widen our political fault lines, pit us against one another and make America ungovernable. Russia is targeting other democracies this way in Europe as well. But Russia isn’t the only player fomenting disunity and despair. They may even be minor players next to some of our own “stateless” oligarchs who benefit from governmental paralysis at every level. These billionaires don’t want to pay any taxes, support the public commons or be told what they can and can’t do. They are among a oligarchs from around the world who control more wealth and power than most countries. They see self-governing entities as obstacles to be overcome in pursuit of wealth, or as competition in their exercise of power, and some have been messing with our politics and social perceptions for years. … there is strong evidence that the rogue interests of certain Western billionaires and Russian oligarchs have converged. Breaking down the economic barriers that keep wealth and power in check under civilian controlled democracies, and the goal of undermining the strength and unity of Western democracies (strengthening Vladimir Putin’s global influence) are essential aligned. This is the bigger picture. It is a picture so large it’s hard to take in and even harder to accept as true. Yet here we are, confronted by a clear case where a foreign power used Twitter to influence the personal conversations we are having with each other. Mainstream media also has its part to play in this NFL protest story and countless others like it. It is the “for-profit” news outlets that select what we will be talking about tomorrow. NFL players protesting during the National Anthem is a real money topic. It attracts a much wider audience compared to another story about race relations. It’s important to remember here that we are the commodity the broadcast media delivers to advertisers. What they choose not to cover, we don’t talk much about. A simple internet search for “NFL protests” proves this point. Lost in the hoopla about the flag is any discussion of why there is a protest. 1. Police in this country kill too many civilians. 2. If your skin is black, you are twice as likely to be one of those killed. NFL players were trying to bring attention to these issues, one superimposed on the other. On average, police kill about two people per day. For perspective, in all of Great Britain police kill about two people per year. If the rate of police homicides were that low in the US there wouldn’t be enough of them to reveal any sort of pattern. But a pattern does exist, and African-Americans are too often the victims. These same racial patterns come up time and again in the American justice system because we have a pervasive and persistent problem with race. Whether we are looking at statistics about arrests, convictions, incarcerations, police stops, etc., the same pattern is superimposed on the data. Racial disparity, by far, is the more stubborn of the two problems listed above. We do need to address it. The other part of the problem, the high number of police killings, is a more solvable problem. We can all agree that the fewer number of civilians killed the better. That might mean better police training, better vetting of applicants and changes in police tactics or philosophy. But here’s the thing. When we try to have that discussion, the social media platforms light up with extreme, emotionally charged messaging that polarizes our public discourse. Conversations quickly become adversarial. Efforts to separate one issue from another to make problem solving easier are sabotaged. Fake news stories begin popping up to further cloud the issues and crazy websites emerge to sustain the divisions thus created. These are often organized disinformation campaigns to reinforce political disunity. They can be so successful that we sometimes can’t even agree on the same set of facts. We get locked into an ideological battle and don’t how we got there. We can’t see the nefarious forces at work behind the scenes. To understand how this is happening we have to consider the massive social media platforms though which we can broadly and anonymously communicate with millions of strangers. Never before have we had a cyber presence where everything we write or reveal about ourselves exists forever and is available to anyone. The whole internet is a gigantic, ever growing database that can be searched and analyzed. It’s a mercurial universe of ones and zeros. Yet, to an ever greater degree, our world view is molded by our social media experiences. Even as we become more enmeshed in the cyber world, this new medium is increasing falling under the influence of powerful people with weaponized information technologies and the motivation to alter our perceptions, our behavior and our culture. Our vulnerability to manipulation by bad actors has never been greater. We need to educate ourselves about this new virtual world in which we find ourselves. We have lost control over our public discourse and need to win it back. We have to learn how to recognize when we are be targeted with propaganda messaging and how to resist falling victim to it. We mustn’t let our authentic narratives become hijacked by those who would alter our perceptions to serve their own ends? If democracy is to survive, if America is to survive, we have to overcome our differences and fight back against those who want to see our people’s Republic fail. The mainstream media is finally starting to get it. They haven’t yet declared that we are at war with both foreign and domestic adversaries bent on dismantling our democracy, but they are starting to report on the outlines of the cognitive warfare raging against us in the media universe. A New York Times editorial piece today broadens awareness of the means by which Russia influenced our 2016 election. And a New York Times Op-Ed piece today by Siva Vaidhyanathan provides further insight into how Facebook allowed (and continues to allow) Russia to influence American politics. Even if there was no direct collusion between the Trump campaign and Russia during the last electionD, there is strong evidence that the rogue interests of certain Western billionaires and Russian oligarchs have converged. Breaking down the economic barriers that keep wealth and power in check under civilian controlled democracies and the goal of undermining the strength and unity of Western democracies to strengthen Vladimir Putin’s global influence are essential aligned. The Facebook, Twitter and alt-right media assaults on public perceptions during the 2016 election were not only parallel, but closely coordinated to produce the surprising outcome of Donald Trump winning the Presidency. The proof of this is slowly emerging. What is even less appreciated now is the ongoing media assaults aimed at Trump’s supporters to maintain their loyalty and their perception that he is saving America from a “deep state” takeover of our government, or from radical Islamist trying to establish Sharia law, etc. We are at war. It is a new kind of cognitive warfare directed at altering our perceptions and dis-uniting us as a nation. It began long before the last election season.. and so far it’s working.